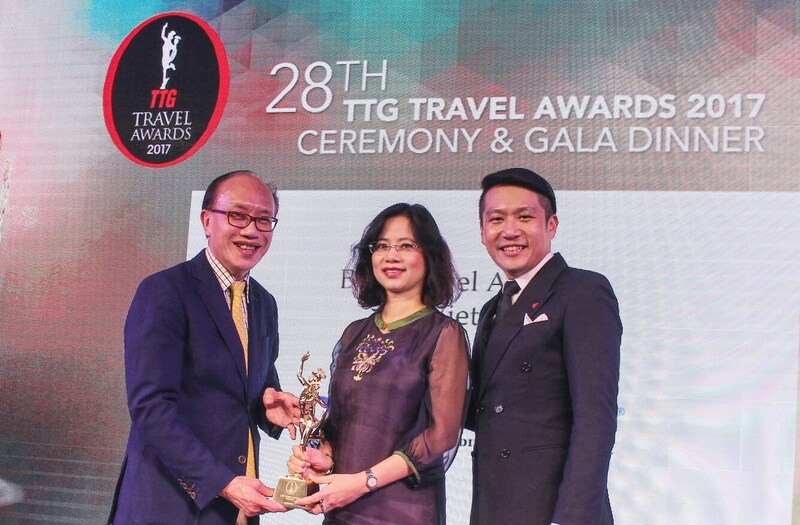 Vietravel, despite a “late born” tourist brand name and half other leading tour operators’ age, over 19 years of formation and development, with its outstanding reputation and quality, has emerged up to the top position and become one of the 16 leading tour operators in Asia, an honorable merit title awarded by TTG Asia. The fast, strong and sustained growth of Vietravel should be accountable to its unceasing renovation, creativity and application of advanced technology in business operation and management, and especially the enthusiastic and untiring efforts and energies of more than 1000 employees in the overall company. Nowadays, we are with no doubt proud to say that the brand name of Vietravel has successfully shaped an exemplary icon of quality, prestige and reliability which are deeply embedded in the mindset of all customers at home as well international friends near and far. As a result, Vietravel has been able to win over trust, support and recognition with hundreds of merit titles and awards. Further building on the previous achievements, acting on the strategic orientations mapped out by the company, the entire management board and staff will continue to work hand in hand, steadfastly marching forward on the road of development, striving for the realization of its set objectives, which is to make Vietravel become the first multinational tour operator by 2015 and one of the 10 leading tour operators in Asia by 2020. And in a nutshell, the goals may be over ambitious, but it comes out to be a far-sighted vision and extraordinary posture of Vietravel. The first leading online website in Viet Nam. You can book tours wherever you are without coming to our Headquarters or any branch of Vietravel. - Wide range of exclusive products and services. - Easy access and just-a-click E-booking. - Various promotions and attractive gifts. - Newsletter “Travel Weekly Program” is issued twice/month, in an amount of 10,000 letters to introduce all domestic and international tours. Located in International airport Tân Sơn Nhất, offering services such as foreign currencies exchange, transportation, accommodation booking, touring as well as air assistance at the spot. Major in supplying high quality coaches of 4- 45 seats. Always on the way to upgrade and supplement new products and to improve the level of professionalism and enthusiastic of the staff. Vinadive is the first diving center in Nha Trang and a trustable point for thousands of domestic as well as international tourists in many past years. In 2008, Vinadive set a Guinness record for organizing the first “Underwater wedding” in Viet Nam. The Firm is a new business enterprise, major in building, installing and repairing civil construction sites. Simultaneously, this Firm also assesses and invests in construction sites and plans. This is now one of the leading Airlines agencies of Vietnam Airlines, Jetstar Pacific, Viet Jet Air and over 30 international airlines present in Vietnam. Additionally, train tickets and passengers assistance services like check in and out procedures, customers services, foreign currencies exchange… at the spots are also provided. Built early in 2012, major in providing domestic and international traveling services, airplane tickets, train tickets to other travel agencies, business delegates groups….or independent tourists….as well as assisting services like accommodation, transportation and insurance for passengers. The key to our success lies in a continuous commitment to service excellence, reliability, best value-added and competitive pricing. Vietravel’s customer care program focuses on loyal customers and is only available through Vietravel system. EXPERIENCE: After 19 - year's operations in the field of international and domestic tourism, Vietravel has gained much experience and been confident of our quality services. PROFESSIONALISM: The fast, strong and sustained growth of Vietravel is based on two important elements: an effective business structure, well-trained and highly experienced staff with in-depth knowledge of tourism as well as excellent language skills. 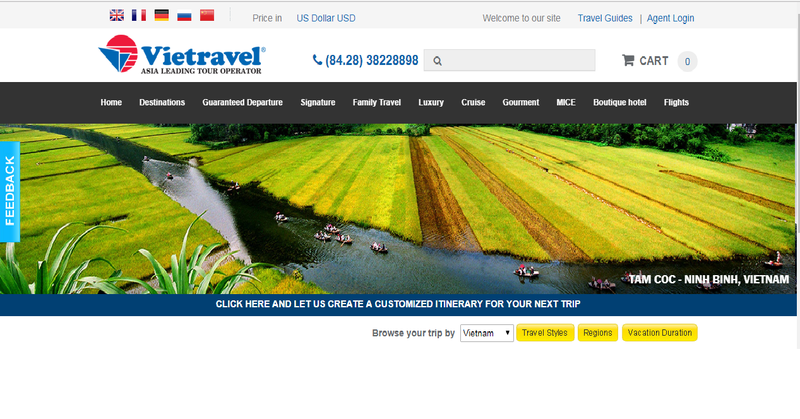 Moreover, the professionalism of Vietravel is displayed by the application of E-commerce into our business activities. The management structure and customer care programs are also applied with quality management standards. PERSONAL CARE: Vietravel with a wide network of branches, offices and affiliates throughout Vietnam and overseas, can easily approach our customers and satisfy their needs accordingly wherever they are. In addition, we have a database which has been updated regularly with an abundant list of hotels, restaurants, resorts, entertainments. Also new destinations have been constantly added by the Product Department in order to bring new experiences and varied choices to our customers. ADDED VALUES: those are the values exceeding the hope of customers. Through our tour programs, members in family will have chances to get closer and understand each other more than ever; colleagues will collaborate with one another firmer. Gifts will also be offered through the programs: “Together win”, “VIP club” or “Membership card”. Above all of those mentioned values are the charity programs combined into tour programs. With Vietravel, tourism is not only for sightseeing and relaxing but also sharing difficulties and responsibilities with the community. SUBLIMATE EMOTIONS FOR EACH CUSTOMER: that is the impression Vietravel will definitely bring to the customer once buying Vietravel’s services When taking tours with Vietravel, customers will surely have opportunities to experience it all: from exploring new lands new people with their history and cultures, to their typical lifestyles and cuisines…..
YOUNG & DYNAMIC: With all their enthusiasm and creativity, our staff tiredlessly strive to bring to customers a wide range of new products with the best quality and competitive price. 24 - HOUR ASSISTANCE: Vietravel provides customers with 24/7 and 365 days assistance through our hotline numbers, even in Tet and national holidays. QUALITY: We commit to bringing the highest standard services and conveniences beyond customers’ expectations. We will continuously update our new exciting tour programs and services at the best prices, just to carry out our business mission “Quality is always our first priority”. Vietravel, initially established in 1995 with only 8 employees, have now developed into a professional and well-trained staff of more than 1000 employees in over 20 branches not only from South to North Vietnam, but also in other foreign countries such as the USA, Thailand, Cambodia. We have been unceasingly developing to reach out to the whole world.